Tire blowouts and flats: it will happen to all of us at some point. The key is knowing what to do when the situation arises. Every vehicle owner should learn how to properly change a tire in case a flat happens when help is far away. The first step in making sure you can properly change a tire is having the proper tools in your trunk. Every vehicle should have a jack, tire iron and a spare tire in the trunk. Without these, it is impossible for you to replace a tire and be on your way. Be sure to look over the jack and the tire iron and test out their function beforehand so you know how to use them when a flat tire occurs. You may wish to purchase a larger tire iron than what came with your car that can give you leverage and allow you to exert more force when attempting to unscrew the tire bolts. 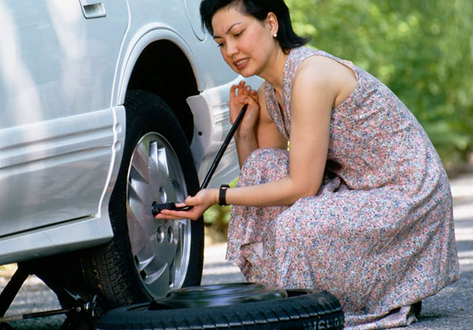 Periodically inspect your spare tire to make sure it is properly inflated. You may also need to carry a brick or a wooden plank in your trunk, especially if you do a lot of winter driving. You can use these items to place under the tires of your vehicle for traction and prevent it from sliding in the snow. Other items that are often overlooked are a blanket and work gloves. A blanket and a pair of gloves can help keep you clean as you're kneeling on the ground and changing a tire. You certainly wouldn't want to show up to a wedding or another important function full of roadside dirt and grease. If a flat tire or blowout occurs while driving, calmly make your way to the shoulder and pull over far enough to maintain a safe distance from passing cars. Retrieve your tire changing items from your trunk, including the jack, tire iron, and spare tire. Place the jack in the correct spot under your car. Most cars have notches etched into the underside frame that is there to let you know where to place the jack. Using the jack in these notches will help ensure your car won't roll away or be damaged from uneven weight distribution. You may want to use your blanket to lie on as you check where the notches are located. If your tire has a hubcap, remove it and place it face down next to you. Use the tire iron's wedged edge to pry it off if need be. Then use the tire iron to remove the nuts that are holding the flat tire in place. Again, this may be difficult, but if you have a long pipe attached to the tire iron, you can get leverage. Keep working at it until all the nuts are removed. Place the nuts inside the hubcap so you don't lose them. Now that the nuts are removed, remove the tire from the wheelbase by pulling it toward you. Put the flat in your trunk and get it out of the way. Then place the spare tire on the wheel and re-screw the nuts back into place. Make sure they are tightened as much as possible, using the tire iron to screw them in. Lower the jack and put all the items, including the hubcap and the brick or wooden plank (if you needed it), back into the trunk. You can be on your way with your spare tire properly installed. However, spare tires are usually only rated for speeds up to 55mph for a short period of time, so be sure to have a new tire replacement as soon as possible. In the meantime, knowing how to properly change a flat tire will allow you to get on your way quickly when the situation arises. Be sure to have all the tire-changing items in your trunk before any trip and you won't need the assistance of a fellow motorist or a tow truck.